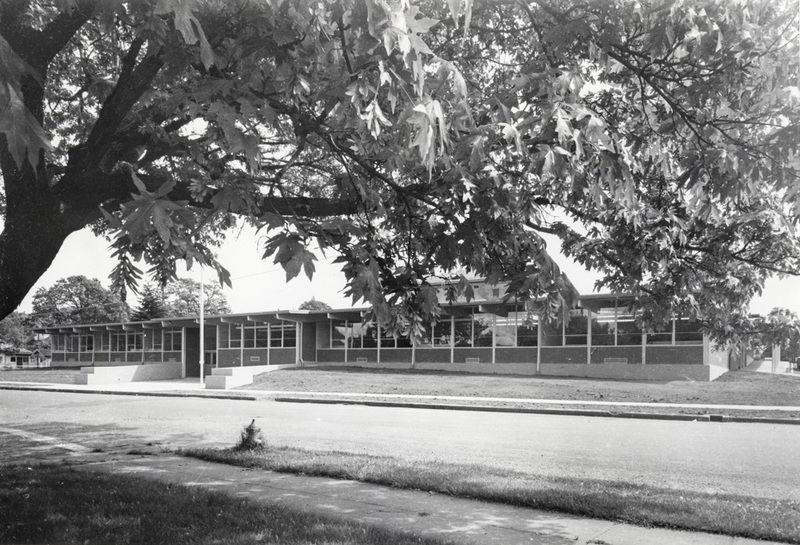 This photo of the May Street Elementary school was probably taken right after its construction. The name has not yet been mounted on the face of the school, and the bell from the original downtown school isn't yet installed. This building is scheduled to be demolished at the end of this school term. The school to replace it is rapidly taking shape on the athletics field to the south, and the removal of this building will allow construction of new athletics fields at this end of the parcel. No trees out front yet in this photo either. My daughter loves it there. I love the light in the classrooms, from the huge windows and interior light wells. The new building has a lot to live up to, for us. My grandmother, Katherine Vaughan Couch, was on the school board when it was built. Four generations of our family went to May Street School. Beginning with my Grandmother and ending with my son. It's gonna be a little sad to see it go for sure. Let's just hope the new one is ready to move into before they tear this one down or we will have another 1957-58 school year problem. I hadn't heard about the 1957-58 problem before. Fortunately the construction is going along pretty well now. I spoke with the principal the other day and he seems confident demolition will start the day this term ends, and the new building will be functional by September. In the late 1970s, we, the students, buried a time capsule and planted a tree on the northeast corner of the school grounds. The capsule was to be recovered in the year 2000. Arthur, can you find out if the capsule was ever recovered? After the end of the term in 1957 they demolished the old square school that my mother had attended. They were building the current building on the same site. Seems there was a steel strike that summer and they could not construct the current school on schedule. They cleaned out two storage rooms in the basement of the current middle school and the 7th graders came there. The gym was broken up into classrooms for the 6th and 8th grades. Must have been a lovely situation. Maybe some of the students who were there at the time can fill us in on what the noise level was under those conditions. I was thinking it was my junior year that the 7th graders were at the high school. Just realized it was our sophomore year as my sister was at the same school as me for her 7th and freshman year. So school was torn down after 1956 school year. Thank you Melody. I have brought up the subject of the time capsule in conversations with friends who were there. None of them seem to remember it. It's nice to have confirmation that it really did happen, outside of my head. At least 2 of my sisters and myself attended May St in the late 50's, 60's. Back then it was 5-8 grades, the two lower grades in the lower north halls, and 7 & 8th grades in the upper halls. Our mascot was the Baby Dragons, as HRHS was the Dragons. My sister Margaret was 7 & 8th grade basketball cheerleader. We planted a time capsule as well in '64. I'm reading about it now in a saved letter I wrote to my grandparents. It was an Arbor Day event & a weeping birch tree was planted atop the capsule. That night someone twisted the stem of the tree and stuffed in into the mailbox. Two other shrubs were uprooted as well and thrown into the street. Enough money was collected among the students to buy another tree.